So I’m at work and kind of bored and wondering what it would be like if I lived a different life, in a different place. It’s not that I’m unhappy in my current situation – but when my mind is bored it tends to wander into that creative no-man’s land straight into my imagination. Next stop ladies and gentleman, the Twilight Zone! Below are just a random sampling of some movie and TV worlds I would occasionally like to inhabit. Cheers – I would love to plop myself on a barstool (preferably next to Norm) and just wax poetic all day with a mild buzz from whatever beer was on tap. The bar itself always looked so cozy, tucked away underground, enveloped by cool wood tones, and surrounded by friends. We know that there is a world going on outside of the bar but we rarely venture out – and that’s just fine. True Blood – You might be scratching your head on this one but if you think about it, Bon Temps is a pretty cool place to live! Sure if you can survive the occasional fang (or claw) this place is full of exciting new things. You can stop into Merlottes for a nice cold beer and some lunch and end the night taking in a show at Fangtasia. Vampires, Werewolves, Shape-shfters, oh my! Back to School – Sometimes I really long for the days when I was… well, back in school! 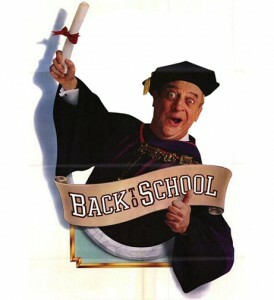 What better movie to take me back to those semi carefree days than this old Rodney Dangerfield classic. Messy dorm rooms, interesting classes (or classes with interesting characters), keggers, swimming competitions, and a great cameo by Sam Kinison. When I’m sitting at my desk doing some mundane task, that’s what I want my life to be like sometimes. High Fidelity – Sparked by his break-up with current girlfriend Laura, High Fidelity follows John Cusack’s character Rob as he tries to figure out why all of his relationships have failed. The movie takes place in Chicago and if you’re into architecture, there’s really no better place to set up shop. Not that this movie focuses on the architecture, but it does make great use out of it’s two main locations; Rob’s apartment and the very cool record store he owns. I imagine myself working at the store with characters like Jack Black and (the underrated) Todd Louiso and I immediately feel at home. So how about you? What movie or TV show would you like to live in?